We are really grateful to our intrepid World Wine Tour 2010 friends Anja and Georges who have supplied the following overview and photos about their wine travels in Asia earlier this year. They are travelling through the world of wine, collecting donations of the best bottles they encounter en route to sell next year at an auction in Napa in aid of the Lao Rehabilitation Foundation. Asia, perhaps the most interesting up and coming market for just about every industry, is also moving fast with wines, as both consumer and producer. And although it’s one continent, the four countries we visited – China, Vietnam, Thailand and India – diverted in their ways of attracting wine tourists. Differences abounded, but overall we found three words that linked together all the wineries we visited. All three words happen to start with the letter ‘E’. For us, on our ‘World Wine Tour 2010,’ China turned out to be not too difficult for arranging appointments with wineries, but if we were just tourists passing through the area, we imagine it might be quite a different story. So, making an appointment in advance is advised! Of the three wineries we visited, only one had a cellar door facility; one was quite a trek to reach and is only for the highly devoted; and the third was a bulk producer, more interesting for our project than for its charm. Some wineries would provide private functions, but weren’t set up yet for public visits, as known in the more established wine worlds. Our top pick for wine tourism was Dragon Seal Winery, the oldest in China and the one which had a great cellar door in the center of Beijing. This ease of access meant you could jump into any taxi to take you there, and after sitting through half an hour of bustling capital city traffic you were ready to try their wines and could also explore a rewarding museum of Chinese winemaking. Dragon Seal was the dream of a French missionary as long ago as 1910, and now offers a tasting of its noble grape varietal productions made in French style. Overall, Dragon Seal seemed to us to be the best bet for any wine tourist heading to the Far East. What’s more, we heard from its managing director that the company was planning to move the winery and cellar door facility from Beijing city to the site of the vineyards, which happen to be right at the foot of the Great Wall of China. Sounds like it couldn’t get more tourist friendly! For a more authentic taste of China, we recommend a visit to Grace Vineyards. Located in central Shanxi province this winery has chosen a great location to build its beautiful French chateau-style winery. The wines were the best we tried in China, and the people working there were wonderful. The only draw back may be that you only reach this blissful place from Beijing after 4 hours of train to get to the Shanxi province, and then another several hours of car ride to reach the vineyards. Luckily, they offer limited accommodation on site, though it might require some advanced planning to arrange. Our Vietnamese wine quest did not go unfulfilled however, as we managed to find another significant producer called Beco Dalat. Perhaps not surprisingly, Beco Dalat is in the same region of Vietnam as Vang Dalat, namely Dalat. This province is a place of anomalies; pine trees rather than palms, and fruits and vegetables of all types rather than rice. The region and city are seen as the ‘France of Vietnam’, with rolling hills and houses built by French aristocrats from the colonial days. During our visit to Beco Dalat, we had a tour through the winery, all well equipped and getting ready to harvest. The traditional grape varieties were just imported a few years ago and so production today is mainly of plum juice blended with table grape juice (which are often boiled prior to fermentation to improve quality). The winery had a great outside terrace where you could enjoy different wines, and with Dalat becoming a tourist destination in its own right, wine tourism is not far behind! Thailand, the country of smiles, had the most wonderful surprises for us, both in terms of quality and hospitality. Just three hours from Bangkok, you can find the beautiful Khao Yai National Park where tigers may be spotted, and great wineries can provide you shelter! Not too many tourists have discovered this amazing holiday spot (beaches seem to be the primary attraction in Thailand). Our first visit brought us to the Village Farm Winery (about one hour away from the park), whose name doesn’t disappoint. Not only located between farms of all kinds (mushrooms etc), Village Farm has a farm-like setting itself. With wooden cottages and vineyard cats and dogs running around, you’ll feel like you’re completely immersed in the farm lifestyle. There is also an onsite restaurant offering simple and delicious locally grown foods that go well in accompanying the wines. Sited even closer to the Khao Yai National park (just behind the hills) we found PB Valley Winery, another winery also geared towards tourism with onsite chalets and a bar-and-grill restaurant of German inspiration. Jump on a bike and you can take a break near their lake while sipping on your great Thai wine! Our last Asia-Wine-Discovery stop was in India, a vibrant and colorful country with many different faces. The major wine growing region of the country is situated in Nashik, just three hours by train away from Mumbai. Nashik is also a city with holy river water, and walking through the market in town can offer you countless hours to lose yourself and your thoughts. For those seeking to visit wineries, there are already over 40 spread over the region, with more to come thanks to the Maharashtra government’s initiative of creating a ‘wine park’ with winery equipment available to lease for grape growers. As everywhere, not all these wineries can be seen as equal, but a great place to start (and perhaps the best at catering for a wine tourist’s visit) is at Sula Winery. This winery offers amazing hospitality with facilities far above the norm in the Nashik region: extensive wine tastings available; a balcony view overlooking the Nashik Lake, and two onsite restaurants plus accommodation. Most wineries in Nashik make wine from a large variety of grapes, some reds being made through public demand. But, it is whites such as Chenin Blanc that are more suited to the climate, which lends itself more easily to this grape, which is used to create a delicious sparkling wine! So what were the three ‘E’s? It is fair to say that each country is at best ‘Emerging’ both as a wine market and a wine producer, and much work still needs to be done for a winery to succeed in sales to its own countrymen. This has resulted in quite a similar approach in each of the four countries focused on Education. Wineries want their fellow countrymen to drink local wine, and need to convince them of their quality first (if not just to drink wine in the first place). This offers outsiders a great opportunity to jump in and learn as well, taking advantage of the refreshing ‘Enthusiasm’ taking place in these new latitudes. Emerging, Educational, and Enthusiastic are perhaps the best words to describe the Asian wine regions, just beginning to flourish. Now may very well be the best chance to catch these giants in their infancy and the experience of a visit will be unforgettable! You can read more about these wineries and the ongoing travels of Anja and Georges on the World Wine Tour 2010 blog. Wine Travel Guides will be supporting World Wine Tour 2010 in helping Anja and Georges plan the itineraries for their wine tour in Europe at the end of this year. 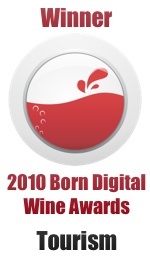 This entry was posted on Thursday, July 1st, 2010 at 9:42 pm and is filed under Wine Tourism General. You can follow any responses to this entry through the RSS 2.0 feed. Both comments and pings are currently closed. Dragon Seal wine museum is not the oldest one in China. The oldest one is Zhangyu wine museum in Yantai, Shandong province. The museum was established in 1992 when Zhangyu moved its production factory and kept the old one as a museum to public. One of its popular features is the biggest underground cellar in old times, which was built in 1908. Zhangyu is the first Chinese modern winery in China. Thanks, Claire for the clarification – it’s certainly sounds like a fascinating new and huge wine country to explore.